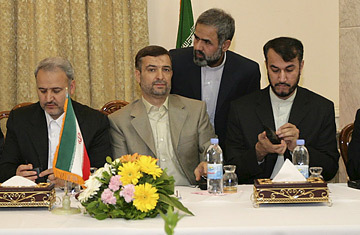 Iranian ambassador Hassan Kazemi-Qomi (4th-L) and members of the Iranian delegation attend a meeting with a U.S. delegation led by U.S. ambassador to Iraq Ryan Crocker in the Green Zone in Baghdad, July 24, 2007. Tuesday's talks in Baghdad between the U.S. and Iran are reported to have been something of a shouting match. No surprise there. Nor is it surprising that both sides emerged from the meeting describing the talks as "positive." Despite their strategic differences on a wide range of issues, Washington and Tehran ultimately share an interest in stabilizing the security situation of the Iraqi government. Still, the competing agendas of Iran and the U.S. will make successful cooperation in Iraq unlikely in the short term. Ambassador Ryan Crocker, representing the U.S. in the talks called by the Iraqi government, complained that the Iranians continue to support Shi'ite militants engaged in sectarian and anti-U.S. violence in Iraq  and charged that such activity had actually escalated since the previous meeting between the two sides in Baghdad, eight weeks ago. His Iranian counterpart, Hassan Kazemi-Qomi, reportedly dismissed the U.S. complaints and said they were not backed by any proof. He blamed the security crisis in Iraq on the presence of "foreign forces," and also demanded the release of Iranian personnel being held there by the U.S. Still, the two sides did agree to create a security committee to address some of the issues raised, and there's every likelihood that such meetings will continue. But their agenda, by mutual consent, will studiously avoid the fundamental strategic conflicts between the U.S. and Iran over Tehran's regional ambitions and its drive to attain the capacity to build nuclear weapons. Iran recognizes that Washington is under increasing domestic pressure to extract itself from the Iraq quagmire, which would be hard to achieve without Iranian cooperation in stabilizing the country. But Iran is unlikely to help the U.S. in the absence of any quid pro quo on a range of other issues. It could be argued that as long as they fear the possibility of U.S. military action against them, they're a lot more comfortable with the U.S. bogged down and vulnerable in Iraq. And even if both sides move toward a diplomatic rapprochement, the Iranians are unlikely to treat Iraq separately from the wider standoff. On that score, Tehran learned a nasty lesson in Afghanistan: As recounted this week by James Dobbins, the former Bush Administration official who led talks with Iran and others on Afghanistan shortly after 9/11, Tehran played a major role in toppling the Taliban and replacing it with a democratically elected government. Expecting to see a warming of relations as a result, Iran instead found itself named to President Bush's "Axis of Evil." The Iranians are unlikely to move to help the U.S. in Iraq until they see that such assistance carries broader diplomatic rewards  or unless the situation in Iraq looks so perilous to their interests that they are forced to put their conflict with the U.S. to one side. For Iran, Iraq is but one front in a complex power game with the U.S. And while the two sides were meeting in Baghdad on Tuesday, there was also activity on a second key front  in Vienna, where Iranian negotiators met with the International Atomic Energy Agency, the U.N. nuclear watchdogs, to discuss plans for inspectors to return to Iran next week. IAEA officials were upbeat about what they said was a "serious and substantial" agreement reached in talks in Tehran two weeks ago, to develop a plan of action in which Iran would settle all outstanding concerns raised by the IAEA over its nuclear program. Anticipating a new round of U.N. Security Council sanctions over its failure to end uranium enrichment, Tehran has moved to restore cooperation with the IAEA, and further talks are expected before month's end between Iran's nuclear negotiator, Ali Larijani, and E.U. foreign policy chief Javier Solana over a deal to end the standoff. By restoring cooperation with the IAEA, Iran isn't running up a white flag. Instead, it is hoping to forestall further sanctions to pursue a deal with the Europeans that strictly limits but does not entirely eliminate uranium enrichment on Iranian soil. The Iranians believe the Europeans are willing to settle for a compromise on the enrichment issue that allows Iran to maintain some limited research capability under international supervision, recognizing that Iran has already gained the know-how that Washington's zero-enrichment position was designed to prevent. And Tehran's newly cooperative stance appears to have at least succeeded in postponing any further U.N. action at least for the rest of the summer. Sanctions represent a substantial danger to the Iranian regime because of the economic stress felt by the majority of Iranians. The sharpest indicator of their potential to spark unrest came in recent riots at gas stations in many parts of Iran, following the regime's move to ration gasoline to prepare for the still distant possibility of sanctions on its import. (Although Iran is one of the world's largest oil exporters, its own refining capacity is so poor that it is forced to import gasoline.) Tehran would obviously also prefer to avoid a frontal confrontation with the vastly technologically superior U.S. military. So, the U.S. and its allies are not without leverage of their own. But it is that broader strategic contest that hangs over the talks between the two sides in Iraq. Absent a "grand bargain" in which Iran and the U.S. find a formula for peaceful and stable coexistence throughout the region, occasional and very public encounters in Iraq are unlikely to produce much progress.